Description In Hydranought, the follow-up to Ultranought, you have control over a powerful warbase. Battle the races of Xyth to gain access to their technology and use it to conquer the galaxy. Hydranought features a detailed skill system that allows you to boost various aspectes of the technology you have access to. This includes one passive, two active and 4 ships with varying abilities per race (and there are 8 races). Battle opponents of varying difficulties across 17 areas. As you defeat opponents in battle, you'll gain experience, which you can invest in skills. Each of the 8 races you'll encounter have their own experience type which can only be used to boost skills of that race. 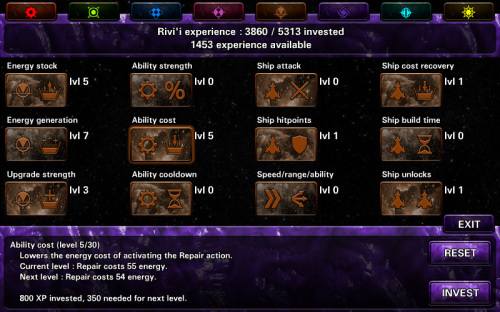 These skills can upgrade the abilities this race offers, or make this race's ships stronger and unlock up to 4 ships per race. As you unlock more ships and improve the abilities of your Hydranought, you'll be able to take on stronger and stronger opponents.